Manav Rachna Educational Institutions (MREI) has been carrying forward the philanthropic mission and zeal of Founder Visionary Dr. O.P. Bhalla under the aegis of Dr. O. P. Bhalla Foundation. In keeping with Dr. O.P. Bhalla’s dream of serving the community, Department Of Prosthodontics, Manav Rachna Dental College organized the ‘5th Free Denture DeliveryProgramme’ on 2nd April 2018. Ms. Satya Bhalla, Chief Patron, MREI was the Chief Guest for the program. The program was conducted in the august presence of Dr. N C Wadhwa, VC, MRIIRS; Dr. Sanjay Srivastava, MD, MREI; Dr. M.M. Kathuria, Trustee; and other senior dignitaries. As many as 59 senior citizens were provided with free dentures and denture care kits (containing denture cleanser tablets, denture cleaning brush, fixon adhesive paste, denturekeeping box). The committed doctors of MRDC also counseled them about the advantages of having complete dentures to improve their lifestyles. Smt. Satya Bhalla highlighted the aim of this initiative, which is to help patients in need in order to do our bit for the society and create an impact on the world at large. Dr. Arundeep Singh, Principal, MRDC and Dr. Pankaj Dhawan, HoD, Department of Prosthodontics, MRDC expressed delight for their contribution to this noble cause. 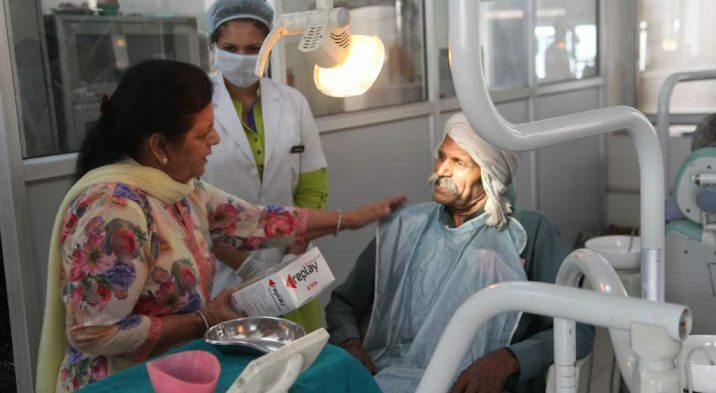 It is noteworthy that the number of free dentures being provided by MRDC are increasing year on year.